A new iPhone and iPad app has been developed to assist communication between elderly Greek Australians and carers who look after them. The Greek Orthodox Community of South Australia (GOCSA) collaborated with Custom Business Apps to create ‘Let’s Go Greek!’, which can be used as a quick reference tool to find commonly used words and phrases in Greek when bilingual staff are not available to assist. Speaking to Neos Kosmos, Luisa Stenta, GOCSA’s Community Care Services manager said: “We’ve released this app free of charge, as we strongly believe that this resource will benefit and support most professionals who communicate with Greek speaking people as well as Greek language students of all years of age.”. With a steadily increasing population of Greeks in Australia requiring the services of workers in the health and aged care industry, the app has a particular focus on including words relating to health, parts of the body, religion, basic instructions, feelings, and even includes a map of Greece. “Our goal is to help the Greek Australian community benefit from a culturally responsive service,” said Ms Stenta. 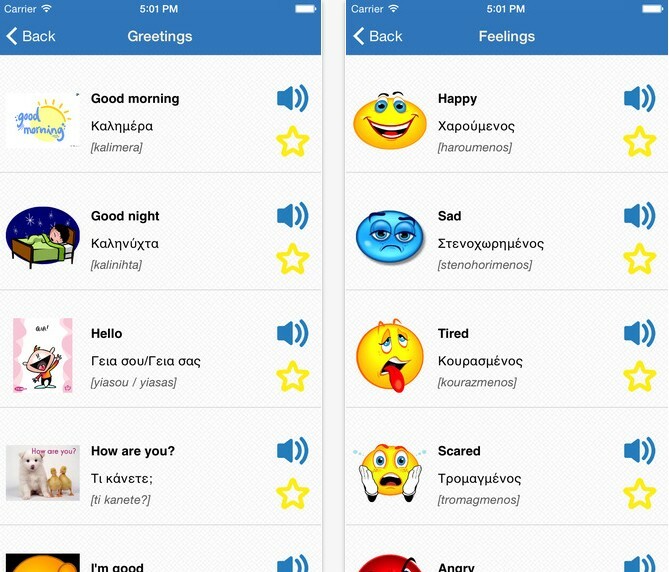 Users are able to press a button to hear the word spoken in Greek, and can create a customised list of frequently used expressions. Each word also has an accompanying image to clarify its meaning. Despite the main intention behind its development, the app is also useful to individuals who are either learning Greek or travelling in Greece, with sections for greetings, numbers, and food. Marianthi Kosmarikou, GOCSA’s community care services officer, said she was pleased with the response to the app since it was released in March. “The first feedback we got from Apple is definitely positive,” she says, but would like to see more users give their opinions on it. The largest number of downloads has been from the Asia-Pacific region, which includes Australia, which represents 37 per cent of the app’s users. There have also been downloads in the US and Europe, at 28 per cent and 26 per cent of users respectively. ‘Let’s Go Greek!’ is free to download through the iTunes App Store.